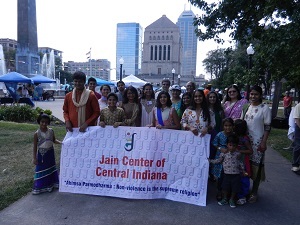 Jain Center of Central Indiana is new member of JAINA in September 2016. JCCI is a small group which meets every month to promote spiritual growth of its members. JCCI inaugurated first Jain Shrine in Indianapolis in June 2015 by performing Pratishtha of Mahavir Swami. In June 2016, they also performed Pratishtha of Adinaath Bhagwan. The Jain temple in Indianapolis is part of the larger Hindu Temple of Central Indiana. Watch the 60 minutes PBS Program "Temple Makers" on http://www.wfyi.org/programs/temple-makers On September 18, JCCI participated in Festival of Faiths held in Indianapolis, where more than 100 different faiths came together to celebrate unity underlying the life on this planet.